Pro welterweight Sean Brady (9-0) is good—really good. But despite his 9-0 record, he hasn’t been signed to a major promotion yet. Why has the UFC passed on signing him thus far? 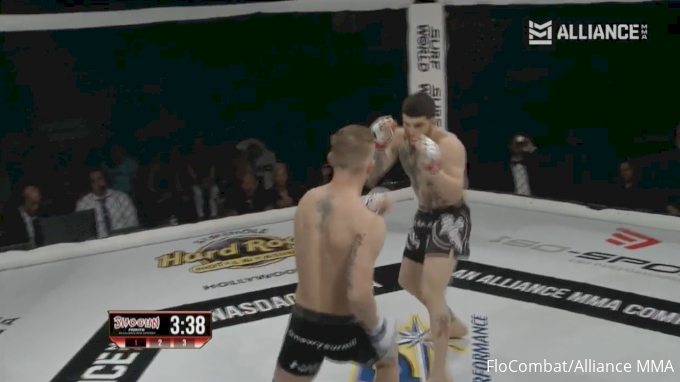 Why hasn’t Bellator MMA jumped at the opportunity to sign another young CFFC champion? Why hasn’t PFL snatched him up for their Season 2 tournament? There are no real obvious answers, but if you don't believe the hype behind Brady, you should. While he's already accomplished quite a bit in his MMA career at just 25 years old, Brady still shows improvements in each and every fight. In his last outing, the LFA 49 main event against Gilbert Urbina, Brady displayed a phenomenal mix of striking, grappling, and overall in-cage savviness. Over the course of the three-round battle, Brady faced spurts of adversity. At face value, some may see Brady getting hit hard as a bad thing. However, in reality, Brady’s ability to absorb damage, stay composed, and not get rattled are key skills he’ll need to have success at the next level, and he showed he possesses them. Urbina isn’t Brady’s only notable victory. He’s been competing against solid competition since turning professional in early 2014. The record of his career opponents (at the time of facing them) stands at 39-15-1. Notably, he holds a win over a UFC veteran in Colton Smith. Training out of Renzo Gracie Philly, Brady is getting in some of the best work in the area. On a daily basis, the 5’9” welterweight brushes shoulders with UFC veterans Paul Felder, Jonavin Webb, and Darrell Horcher—as well as fellow rising stars Jeremiah Wells and Pat Sabatini. At a minimum, you might see Brady land on next years’ Contender Series. At this point, however, many believe he’s adequately proven he’s ready to make the bigger jump. With the UFC returning the Northeast this winter, it’s quite possible they’ll snag Brady to add local flavor to the card. Jan. 19, the largest MMA promotion in the world will roll into Brooklyn's Barclays Center once again, marking an appropriate location for Brady's debut. The event marks the launch of the UFC’s deal with ESPN, so there’s a good chance the promotion will stack the card with hungry, exciting fighters who will put on a show. If they want to make a real impression to a new audience from the get-go, Brady is their guy. Dear UFC, just sign Sean Brady.